In 1990, a group of women artists and writers in Minnesota became alarmed by the growing number of women being murdered by their intimate partners or acquaintances. These women partnered with local community-based agencies and formed the Arts Action against Domestic Violence. Together, they began to speak out against domestic violence and honored those who died as a result of this epidemic. 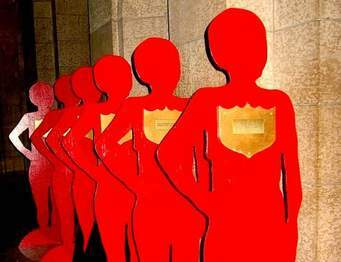 The women created 26 free-standing, life-sized red wooden figures, each one bearing the name of a woman whose life ended violently at the hands of a husband, ex-husband, current or ex-partner, or acquaintance. A 27th figure was added to represent those uncounted women whose murders went unsolved or were erroneously ruled accidental. The figures were called the Silent Witnesses. On February 18, 1991, more than 500 women met at a church across the street from the Minnesota State Capitol with the Silent Witnesses. The women formed a silent procession escorting the figures single file across the street, up the steps, and into the State Capitol Rotunda for public statements and a press conference. The sheer volume of space the figures occupied spoke of their power, and their loss. The Silent Witness Exhibit was officially launched. Inspired by the exhibit, the project coordinators and supporters formed a national initiative dedicated to the elimination of domestic violence homicides. Today, there are Silent Witness Exhibits in all 50 states and in 20 countries. Domestic Violence Services of Cumberland & Perry Counties maintains its own Silent Witness Exhibit each year during Domestic Violence Awareness Month in October. To commemorate the lives of the victims who died as a result of domestic violence in Cumberland & Perry Counties, we would like to share their stories. Carolyn was a school bus driver for Big Spring School District. She was a mother of four, and a proud grandmother of eight. She loved spending time with her family and her dogs. She was killed during an argument with her male housemate who then turned the gun on himself. No criminal charges were filed in this murder-suicide. Randi was murdered in her East Pennsboro home by a hit-man hired by her husband. Her husband admitted to planning her murder in order to receive life insurance. Randi was found strangled and stabbed 27 times in her garage. Both the hit man and her husband pled guilty to first-degree murder and are serving life in prison without parole. Randi’s mother, Nancy Chavez, founded Randi’s House of Angels, a nonprofit that offers referral and support services to those who are suffering from domestic violence. Learn more at www.randishouseofangels.org. Melissa was a 26-year-old mother of two who was kind-hearted and loved by everyone. Melissa moved in with her mother after separating from her ex-boyfriend, who was serving a prison sentence for previously assaulting and threatening her. After being released from jail, her ex-boyfriend assaulted Melissa in her mother’s backyard. He repeatedly stabbed her and cut her throat, then fled to Arkansas where he was arrested after a high-speed police chase. He pled guilty to second-degree homicide and was sentenced to life in prison without parole. Kim Anne Houser-Keefer always prided herself on raising two beautiful daughters. She was strong-willed, witty, and had a beautiful smile. She was shot to death in the parking lot of her daughter’s elementary school by her ex-boyfriend, who then turned the gun on himself. Toni was a 42-year-old mother of 3 beautiful children (Shea, Ryan, and Jordyn). Toni had beautiful blue eyes, a hilarious sense of humor, and was the type of person that everyone loved. She was an excellent mother. Toni was shot and killed by her controlling ex-boyfriend. He was found guilty of first-degree murder and was sentenced to life in prison without parole. Toni’s family maintains a website in her honor, which you can view here: http://toni-clouse-myers.memory-of.com/. Sheri was a giving and loving person, and was the light of her mother’s life. Sherie loved animals and was an avid Pittsburgh Steelers Fan. Sherie was murdered by her controlling husband, who shot her eight times. He pled guilty to third-degree murder and was sentenced to 30 years in prison. Nicole was an energetic and passionate young attorney at MidPenn Legal Services when she was murdered at her home in Mechanicsburg by her fiancée. By all accounts, there was no history of violence in their nine-year relationship. However Nicole had recently become troubled by her fiancée’s increasingly disturbing behavior. As a young child, he had witnessed the murder of his stepfather by his mother. As an adult, he failed out of many colleges, and was obsessed with violent video games. Three days after Christmas in 2010, he ‘snapped’ and strangled Nicole to death. He notified police the following day, and turned himself in. Trisha was a beautiful, loving person, and was a wonderful mother to her daughter, Ryleigh. When she was 18 weeks pregnant, Trisha was murdered by her ex-boyfriend, from whom she had an active protection from abuse order. Her ex-boyfriend pled guilty to criminal homicide, murder of an unborn child, prohibited possession of a firearm, and theft by unlawful taking of a weapon. He was sentenced to 20-40 years in state prison. Lisa was the mother of two children, Rebecca and Matthew. Lisa had a contagious laugh, a beautiful smile, and a heart of gold. Her ex-girlfriend, who had a history of stalking and verbal abuse, shot her death in her own home, and then turned the gun on herself. Lisa’s 17-year-old son was home at the time, and was able to escape and call for help. Trisha was a beautiful, vivacious, 29-year-old woman with a radiant smile that could light up a room. Trisha’s boyfriend, who had discovered that she was going to leave him, slit her throat while she was sleeping and dismembered her body, hiding it in trash bags in the bedroom of her home. When Trisha failed to show up for work 2 days in a row, her coworker called police. After a 7-hour standoff, her boyfriend was eventually taken into custody. He was sentenced to life in prison without parole. Mary was a loving mother, wife, and grandmother. She was brutally murdered by her 54-year-old son who beat her, stabbed her, and cut her throat. He and his girlfriend then attempted to hide her body and clean up the crime scene. An anonymous tip to the Carlisle Police Department caused the police to visit Mary’s home, where her son confessed to murdering his mother for drug money. Cori was a beautiful, loving woman who had a smile that could light up a room. On her 23rd birthday, Cori was on her way to a family picnic with her daughter and fiancé, when her fiancé drove their car in front of an oncoming train. Cori was killed immediately, her fiancé suffered a broken arm, and her daughter was critically injured, but survived. Her fiancé had been under the influence of drugs at the time he was driving, and had a history of domestic violence. Ciara was a beautiful, happy little girl, with a contagious laugh and beautiful brown eyes. Ciara loved Christmas, shopping, and animals, and enjoyed spending time with her family. Ciara was accidentally shot and killed during the service of an eviction notice on her father. When a Constable arrived at the home, Ciara’s father pointed a loaded gun at the Constable, who opened fire. Ciara’s father was shot in the arm, but the bullet traveled through him and struck Ciara in the chest, killing her. She was pronounced dead at the scene. Her father, who had a history of violent and reckless behavior, was charged with Ciara’s homicide.